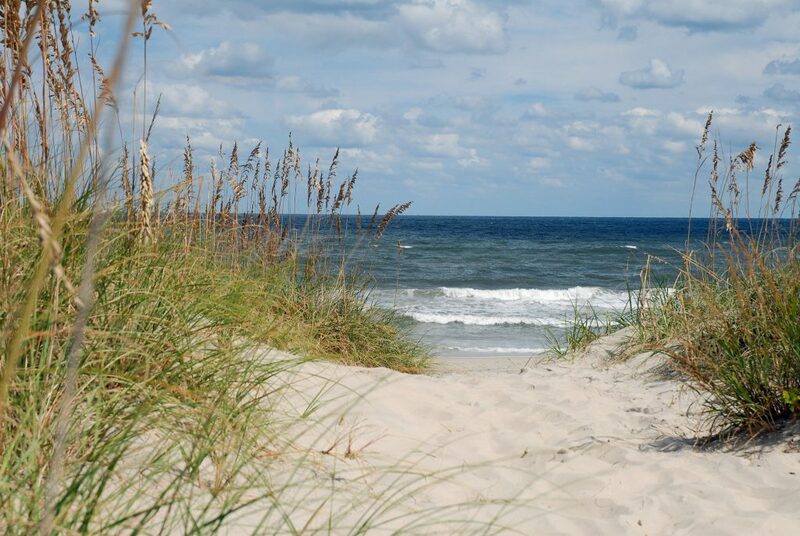 The beaches of each Outer Banks town all have sand and water, but the similarities end there. 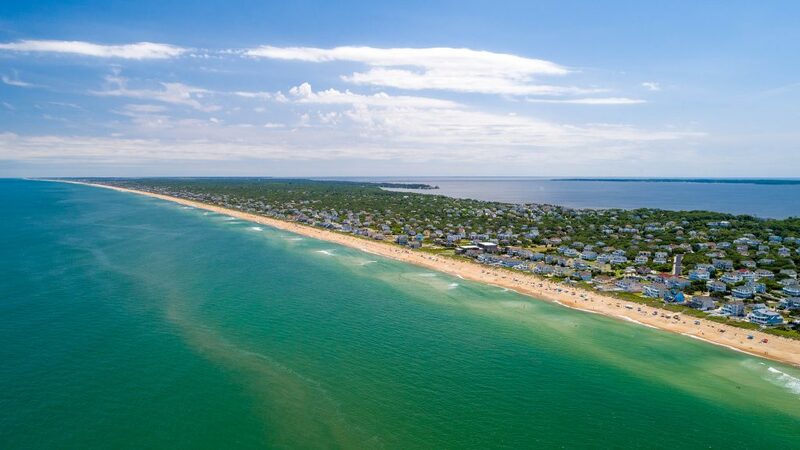 Whether you prefer convenient beach access with parking and showers or a more remote spot in the sand, we’ve compiled a comprehensive guide to the beaches on the northern Outer Banks, sorted by town as well as by activity. If you’re planning a particular activity during your stay or have little ones in your group, we’ve got you covered. Kitty Hawk is the first Outer Banks town you will encounter upon crossing the Wright Memorial Bridge to the Outer Banks. There are many beach accesses in Kitty Hawk that offer free public parking. Our favorite is the Kitty Hawk Bath House, located at milepost 4 on the beach road (aka Virginia Dare Trail). Cross the beach road from the bathhouse to the wide sand access, which includes a lifeguard stand. The beach in this particular stretch of Kitty Hawk does not have any oceanfront homes, which means soaking up the glorious late afternoon sunshine is an option. If you get hungry or thirsty, you have options! Black Pelican Cafe is right next to the bathhouse and has fantastic seafood and excellent wood-fired pizzas. Hurricane Mo’s Beachside Bar & Grill, located just across the street from Black Pelican, offers specials on wings, shrimp, and tacos during their “happiest hours” in the afternoon. 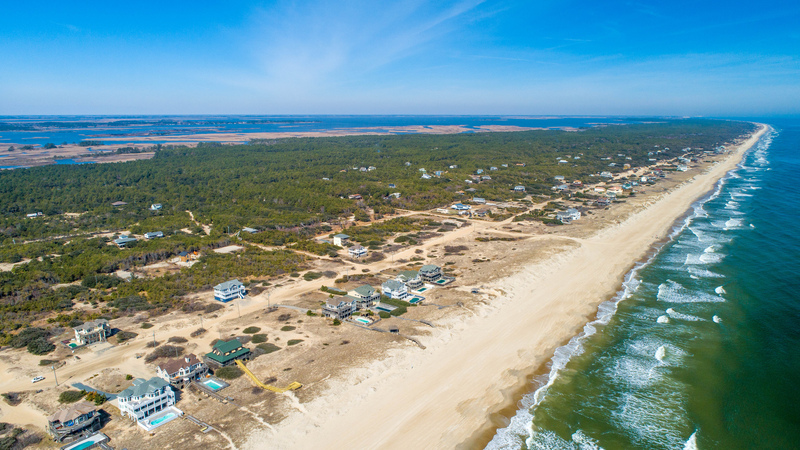 From Albatross Street around milepost 10 all the way down to Coquina Beach around milepost 26, Nags Head has a plethora of beach accesses to choose from. 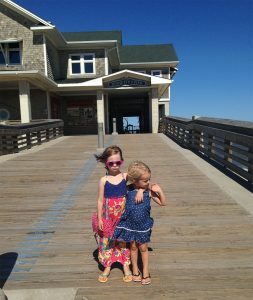 Our favorite Nags Head beach access is at Jennette’s Pier. Step inside and explore Jennette’s Pier when you need a break from the beach. This 1,000-foot concrete and wood pier features three large windmills that help power the facility, which includes an aquarium and full-service fishing pier. The Pier shop offers beach supplies, gifts, drinks, snacks, and coffee along with fishing tackle. Getting hungry? Eat fresh seafood at Sam & Omie’s, one of the oldest eateries on the Outer Banks, or grab a classic burger and fries at Dune Burger, both just across the street from Jennette’s Pier. Take the kids to play at Whalebone Park, which is behind Dune Burger. The playground features a large boat play structure, along with swings and other play structures. The 4×4 Beaches are only accessible via 4-wheel drive vehicles. Our favorite place to park is between mileposts 14.5 and 17. Parking in this area allows beachgoers more play area between their parked vehicle and the shoreline as vehicles are not permitted to travel in this area during the summer months. 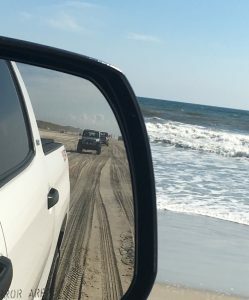 Before you head to the 4×4 beaches, be sure to read our 4×4 beach driving information that covers everything from beach parking permits to lowering your tire pressure to tips on how to drive on the sand. Easy unloading! Once you’ve chosen your spot and parked, there’s no need to haul your stuff to the beach – you’re already there! Open the tailgate and set up your umbrella and beach chair right beside your vehicle. Peace and quiet. No commercialization means there are no stores nearby. Be sure to bring everything you need for your day. A one-way trip to the nearest convenience store can easily take more than a half hour, but the remoteness of the 4×4 beach is what makes it special! A fully stocked cooler with lunch and plenty of snacks is essential for your 4×4 beach day. Our favorite access is at Ocean Bay Boulevard at milepost 8.5, easily recognized by the large yellow and green bathhouse. If you get hungry or need beach items, head across the street to Stop N Shop. This may look like an ordinary gas station convenience store, but Stop N Shop is an Outer Banks institution. Locals know that the deli features some of the best subs on the OBX. Stop N Shop also has an impressive selection of flip flops and sunglasses. Need a new beach chair, boogie board, or beach toys? They’ve got you covered. Looking for souvenirs, jewelry, or beach wear? They have those too, along with all of the normal convenience store items. .
We can’t pick just one beach access point to be our favorite in Southern Shores because while all beaches are public, there is no public parking available within the town limits. In other words, all of Southern Shores can be classified as our favorite beach! Parking is available by permit only and strictly enforced. If you are staying in Southern Shores, you’re in luck – limited access means the beaches are not crowded. 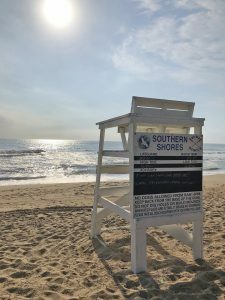 Due to the lower population of beachgoers in Southern Shores, there are just four lifeguard stands in the town, at East Dogwood Trail and 142 Ocean Boulevard from Memorial Day weekend through Labor Day, and at Ocean View Loop and Hillcrest Drive from mid-June through mid-August. Ah, Corolla, with its wide, soft sand beaches and sparkly, rolling waves. Our favorite beach is the one accessible from the Corolla Light Community. This ocean to sound community is packed with amenities and has a trolley that will take you to and from the beach. That’s right, no need to go through the frustration of finding parking! Gather up your family and your beach stuff and head to the nearest trolley stop. The trolley will drop you and your stuff off at the beach access at the oceanfront complex. 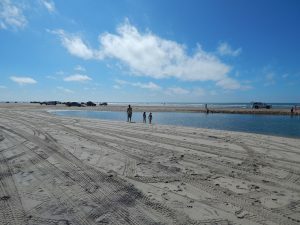 As with Southern Shores, there are no public beach accesses in the town of Duck. The beach is generally accessed by foot via a neighborhood walkway. The best beach can be found behind the oceanfront homes, however, if you cannot stay on the oceanfront, we suggest staying at a home in the Four Seasons community to take advantage of the beautiful beach access. Sometimes, it’s best to select which beach to go to based on the makeup of your group or what activities you would like to do at the beach. 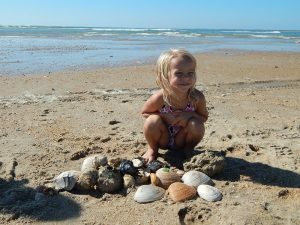 Click below to jump straight to our recommendations for the best Outer Banks beaches for families, toddlers, and for finding shells. 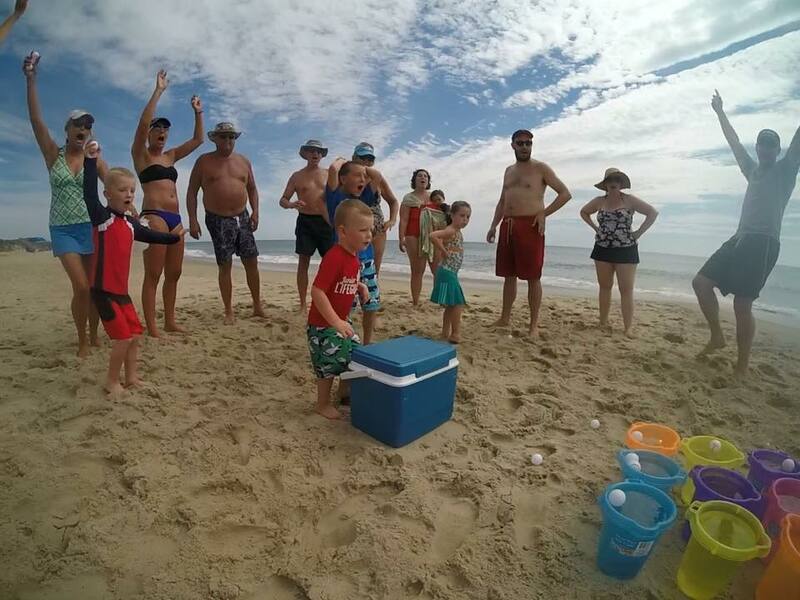 All Outer Banks beaches are family friendly, however, some offer more conveniences than others depending on the stage of life of the members of your group. 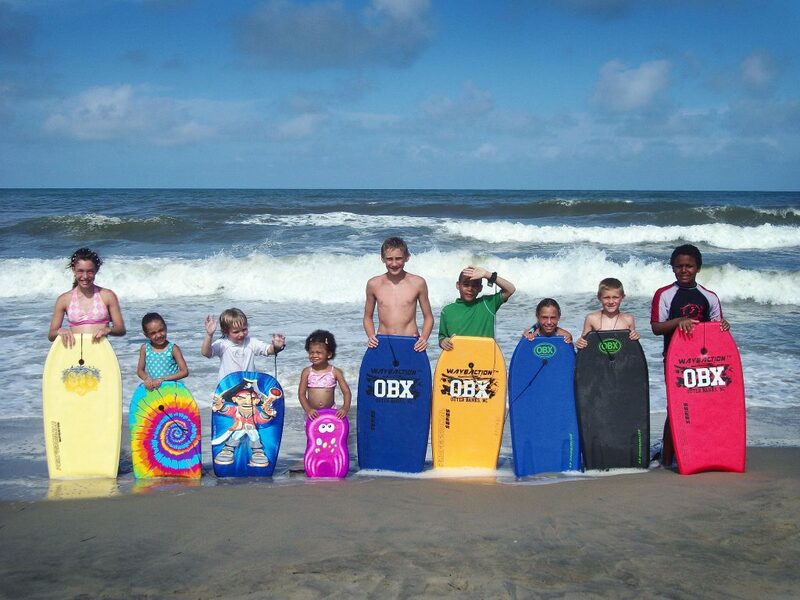 The best Outer Banks beaches for families with children and/or seniors are beach accesses that offer paved parking, no stairs, and no streets to cross. 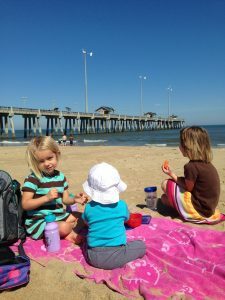 Our favorite beach access for families is Jennette’s Pier in Nags Head. In addition to convenient parking, there is a blue stabilizing mat on the sand that helps those with mobility issues get out to the beach. The bathhouse is located right on the beach for convenient bathroom breaks. If you have someone in your group with mobility issues, there are wheelchairs that have been specifically designed for the beach. They are available for rent from several local equipment rental companies, and some of the local fire stations have one that they will let you use during your stay. Call a local equipment rental company or fire station ahead of your vacation for more information and availability. Anyone with a 3-year old will understand the planning and logistics involved in getting a toddler and any other children AND all of your stuff to the beach. It can be an exhausting feat just to get your toes in the sand! 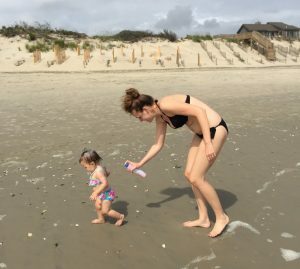 The best Outer Banks beaches for toddlers are the ones accessible from the backyard of vacation homes, but if staying on the oceanfront isn’t an option for you, we recommend Jennette’s Pier beach access in Nags Head. The paved parking lot and blue stabilizing mat make it easy to roll your stroller or beach cart right out onto the beach. Speaking of beach carts, if you have children in your group, we highly recommend having a beach cart to haul your stuff to the beach. There are several local equipment rental companies that rent beach carts by the day or week. Trust us on this one, it’s worth every penny! If you’re staying in Duck or Corolla, there’s an even better option than a beach cart: hire a company to haul your stuff to the beach. Enjoy the Beach OBX will take your stuff to the beach and set it up for you. At the end of the day, they will pack everything up and haul it back to where you are staying. The best Outer Banks beach for shells is widely believed to be Cape Point on Cape Hatteras National Seashore. In fact, an island formed off of Cape Point in 2018 and was dubbed “Shelly Island” because of the sheer volume of shells there. Cape Point is not easily accessible to everyone. A 4-wheel drive vehicle and a beach driving permit are required, and there are times that the park service closes the beach to vehicles due to nesting shorebirds. Looking for shells a bit closer to your vacation home? Walk the beach early and often. Watching a stunning sunrise over the ocean is an added bonus to getting up early to look for shells! The ideal time to find them is just after a storm has passed. A bounty of shells usually wash up after a nor’easter, when the ocean stops churning. 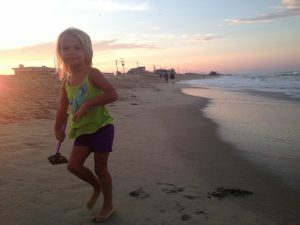 The 4×4 beaches can be especially fruitful for shell collectors after a spring or fall nor’easter. 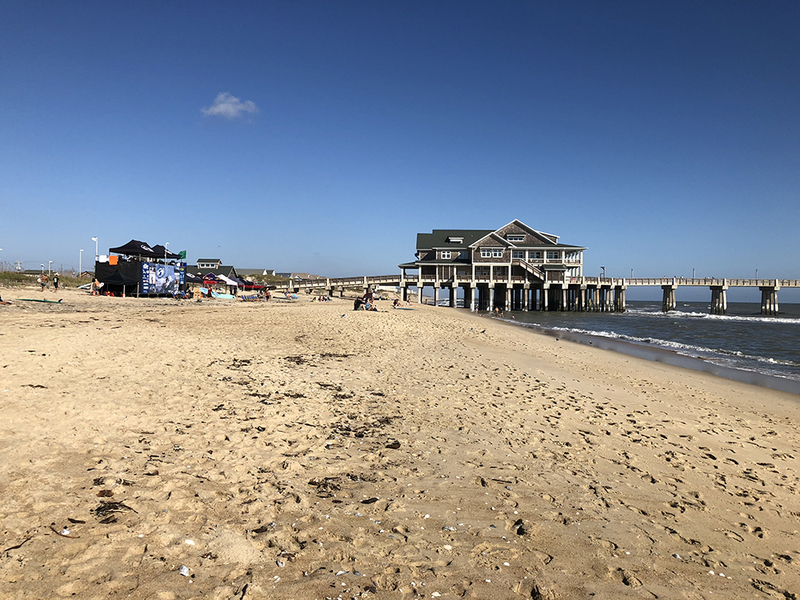 Although we’ve listed our favorite Outer Banks beach for each town and activity, we must mention that we haven’t found an OBX beach that we don’t like. You might feel hungry after a long day at the beach. If you find yourself yearning for some delicious food and a great atmosphere, continue reading to learn about the best seafood restaurants in the OBX!